We all know how upsetting it can be when a charging cable goes missing—especially when it powers an intimate accessory! 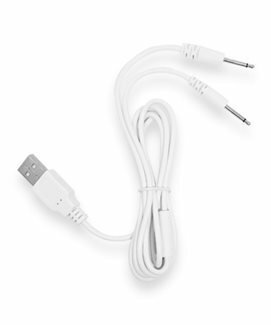 With this replacement charger for your Pure Romance toy, the possibilities are endless! Compatible with your Frenzy toy. Can plug into any USB port, even your computer! Plug the USB cord into any USB-to-wall adapter or USB port. Plug in the toy to be charged. LED light will illuminate while product is charging. When product is fully charged, LED light will turn off. Only compatible Frenzy in the Pure Romance Carnivale Collection. See below for individual product charging times.